The roses on the table at Andorra Banquet Hall In Schererville, Indiana were very eye catching. Sure, the red definitely did pop, but the sheer number of them was the real story. Sixty red roses for 60 years of marriage. Happy Anniversary Bill and Helen!! I love to document my work here on this journal and it certainly was an honor to photograph this milestone event. My main motivation for this post today is to provide inspiration to the (much) younger brides and grooms that I usually photograph. I'm sure Helen and Bill had their moments throughout the years, but yet here they are many decades later celebrating with family and friends. A vintage wedding photo sits next to 60 red roses at an Anniversary Party at Andorra Banquet Hall. 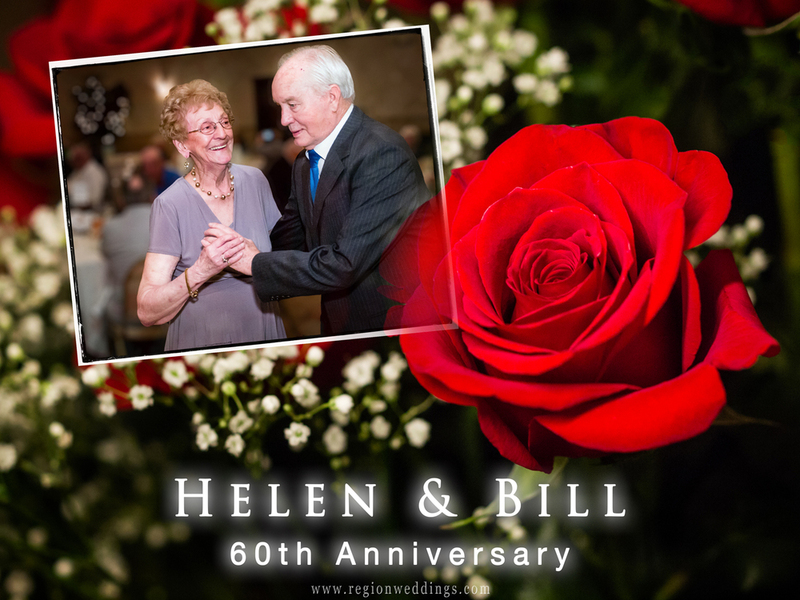 It was wonderful to see Helen and Bill's wedding portrait in pristine condition sitting next to the 60 red roses. It warms my heart to know that my photography will someday be displayed at Silver and Golden Anniversaries in years to come. As I'm out photographing Aaron and Lisa's wedding this Saturday, I will definitely have Helen and Bill on my mind. Capturing great moments and preserving memories that they can look back on 60 years from now is an incredible honor. I can't wait.